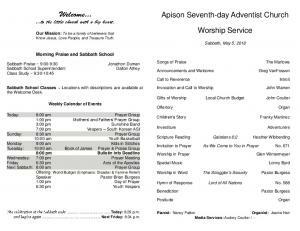 Today: 8:57 p.m. Next Friday: 8:58 p.m.
APISON CHURCH NOTICES A SPECIAL WELCOME TO OUR VISITORS! We're happy you have chosen to worship with us today. If we can help you in any way, please see today’s Resource Elder, Eric Schoonard, for assistance. Communion Service ~ We will have Communion and Ordinance of Humility Service on Sabbath, July 7. Let us prepare in advance with selfexamination, repentance and confession for this special service. LCA Work-bee ~ Sunday, July 8, is our work-bee for repairs scheduled for 8 a.m. If you have expertise or wish to lend a helping hand, we plan to replace school toilets and gymnasium lighting. Hope to enjoy a good team effort and get the work done quickly. Sue Bruce ~ Continues to battle MS, loss of vision in left eye. George Burgdorff ~ Under Hospice care. Dean Coulter ~ Recovering from a biking accident. Norma Jean Dean ~ Recovering at Collegedale Life Care Center. Virginia Holley ~ Health challenges. Lisa Jennings ~ Health challenges. Scott Springer ~ Health challenges. Brian Wilson ~ Health challenges. Kari Wilson ~ Health challenges. Prison Ministry ~ please find addresses on the bulletin board for fellow members in prison and encourage them by sending cards. Are you looking to be a committed man or woman who has a passion for souls to be trained and mentored to minister to the forgotten ones who are in our local jails? Call John for info 423-316-6722. Apison Hour of Prayer (AHOPe) ~ Join us as we seek the Holy Spirit for our lives, our church, the world church and government leaders. Sabbaths at 8 a.m., either in the Church Library or via conference call at 712-775-7031; access code 682-097-212#. Also Sundays at 8:30 a.m. at the same phone number and code. Men's Ministry Steps to Christ Book Study ~ Join us Sundays at 7 p.m. at Greg Williams’ office, 11014 Apison Pike, as we seek a closer walk with Jesus. Kids in Stitches Ministry ~ Join us Mondays from 9 - 1 at the church. Women's Breakfast ~ Sunday, July 15, at 9 a.m. will be the next Women’s Breakfast. Theme: Faces of Grace. Come and share in fellowship, fun, food and be uplifted by stories of God’s grace at work. Invite a friend. It will be at the home of Kelly Peden, 350 Geneve Lane SW, Cleveland (only 8 minutes from the church). RSVP Janice 931-7878108. Vacation Bible School ~ Monday through Friday, July 16-20, we will have VBS. We need volunteers! For more information and to help, please see Eleni Martinez. Family Fun Night ~ There will be no Family Fun Night this month or July. Pastor Out of Town ~ Pastor Burgess is presenting at the New York Conference Camp Meeting and will be out of town through July 3rd. Prayers are appreciated as he travels and speaks. Book Study ~ If you would like to sign up for a book study of SOS Help for Emotions: Managing Anxiety, Anger and Depression, please contact Pastor Burgess. Most, if not all, of us could benefit from changing the way we think about the challenges we face on a day-to-day basis. Passed Away ~ Shirley Hagerman, a long time member of Apison Church, passed away Wednesday, 6/20/2018. Her wishes were to have no formal service. Acts of the Apostles Study ~ Everyone is invited to attend on Fridays at 6:30 p.m. at the church. No childcare. Card to Sign ~ Next Sabbath will be Samuel and Dorothea Nzoikorera’s last official Sabbath with us as Samuel is transferring to another church to continue his training. We have appreciated Samuel's dedication in ministry and Dorothea's warm hugs and smiles. Please take time to sign the card at the welcome desk today and remember them in prayer. 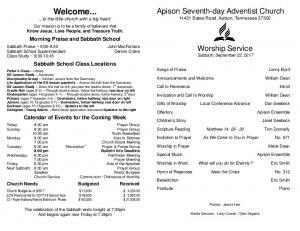 Remember to check our church calendar at www.apisonchurch.org. 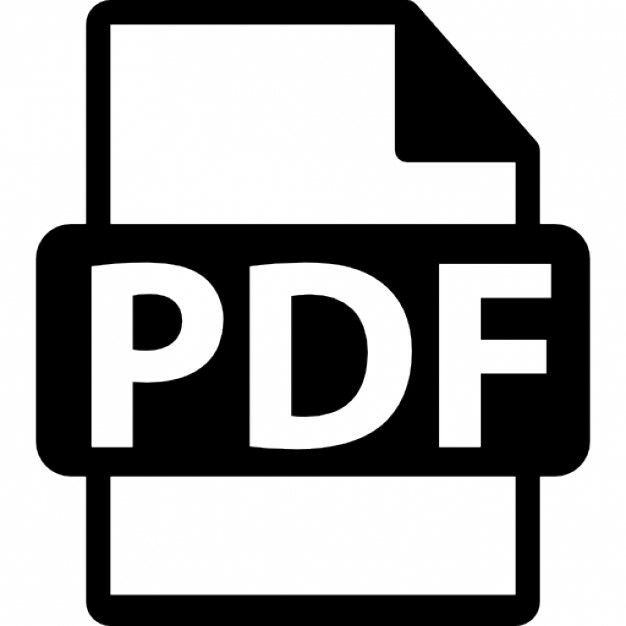 Area Announcements Adventures in Service ~ One of our area's hidden service opportunities awaits the adventuresome and daring. Spend an evening at the jungle that is the Samaritan Center's donation dock on a Saturday evening. Enjoy blazing a trail through piles of treasures, selecting, sorting, and separating as you go. And with each inch of trail blazed, our community's weakest are given help and hope. If you're up to this fun and fascinating evening adventure, please contact safari director, Bethany Hills, at 423-2387777, ext. 22. Annual Rummage Sale ~ The Bowman Hills School in Cleveland is having their annual rummage sale Wednesday - Friday, June 2729. If you have items that you would like to donate please call or text Lee at 423-715-5323 for information. You may bring items Monday - Friday to the school gym back door. If no one is there, you may put it in the trailer or leave in front of the doors, under the overhang. We encourage you to attend this Sale which will take place on June, 27, 28 & 29 at 8:00 a.m. The school appreciates any help you can give. Healing Music Festival ~ Save the date and get tickets for Thursday through Sabbath, July 19-21, at the Collegedale Community Church for the second annual Healing Music Festival. Jaime Jorge, violinist, will host this benefit for kids in Chattanooga's inner city and will feature The Isaacs, Legacy 5, Freedom Singers and/or Message of Mercy. Call Kim at 423-488-4800 or visit jaimejorge.com/healingmusicfestival for more information. Collegedale Community Church Concert ~ Message of Mercy is celebrating 20 years of music ministry on Friday, July 20, at 7 p.m. at the Collegedale Community Church. Join current and former members for a FREE concert celebrating what God has done. A love offering will be taken as part of the Healing Music Festival benefiting inner city kids in Chattanooga. For more info contact Kim at 423-488-4800.